I have just started Charcutería: The Soul of Spain by Jeffrey Weiss, but I can already tell that it is going to be the best thing I have ever read in English on the subject of Spanish charcutería, the craft of making great jamones and embutidos, the magnificent hams and charcuterie of Spain. 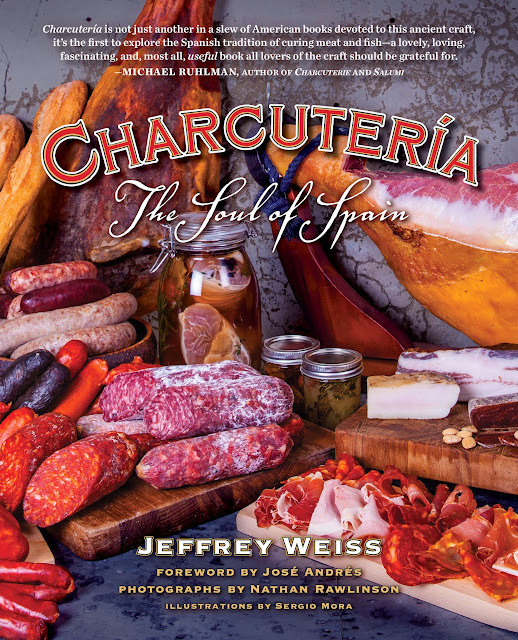 Charcutería: The Soul of Spain by Jeffrey Weiss. Foreword by José Andrés. Photographs by Nathan Rawlinson. Jeffrey Weiss is a professional chef with more than 15 years of experience, having cooked with James Beard Award-winning chef José Andrés and Spanish-based chefs Daní Garcia and Adolfo Muñoz, and in America, with April Bloomfield. He is one of a select few Americans to earn the prestigious ICEX culinary scholarship that allowed him to live in Spain, learn its regional cuisines, and cook in the kitchens of top Spanish chefs. He recently opened the Monterey, CA restaurant jeninni Kitchen + Wine Bar.